Well, it has been a little while since I posted…. (not as long as some of the other contributors to this blog, ahem, hint hint??) but I have one excuse. I finally took Ms Janome to the sewing machine hospital. Poor thing, she was in dire need of a service – no wonder she’d been complaining about everything I tried to sew! It cost me a bit more than I expected, but she now runs like a dream. Plus, the guys I took her to had a fab array of vintage and retro machines in their shop – it was fun to drool over those whilst I was there! Mr Pinnock will likely get taken on a trip there too. Once I finally got my machine back, I got straight into it! Typically though, I managed to start five different projects so of course none of them are getting finished! 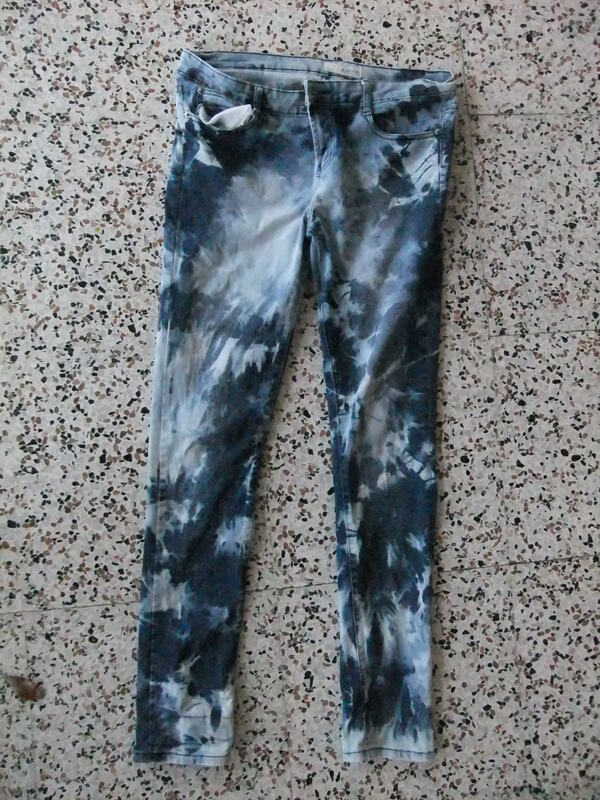 The one I’m most enamored of at the moment are my tie-bleach jeans. I got these dark blue skinny jeans on the sale rack at Salvos for $2. They are Cotton On brand, and very stretchy – which is great for my womanly thighs but they were a little too loose in the waist. So I figured, I would try this bleach thing, and if it didn’t work, I hadn’t lost a pair of jeans I adored. 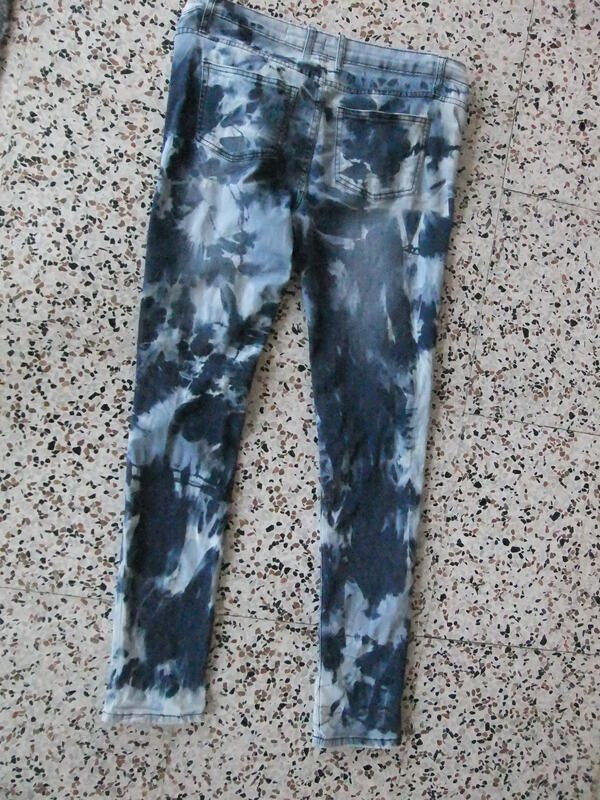 I had recently come across Charity Shop Chic’s blog about tie-bleaching a pair of jeans, which is where I got the idea. I wasn’t sure about the ratio of bleach to water, even after reading a couple of other blogs on the same topic – they were all from US or UK and used various brands of bleach that I’d never heard of, so I had no idea if they were the same strength. So I just winged it. 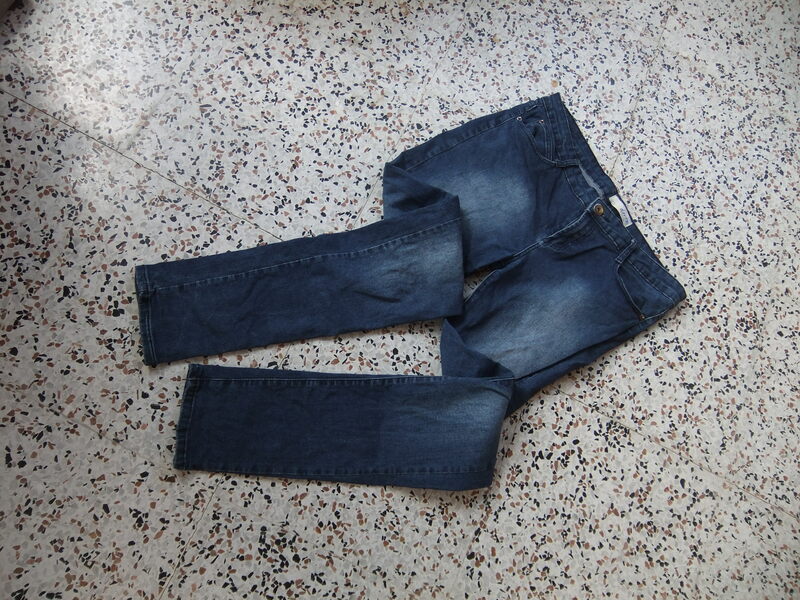 I screwed the jeans up with a bunch of rubber bands and chucked them in a bucket of water with about 2 cups of laundry bleach, and left them for several hours, turning them over a couple of times along the way. Result! How striking are they now? Of course, they still smell a bit bleachy after several rinses, but I think that will be gone with the next wash. I put a couple of darts around the waist to make them fit a bit better, but I’m pretty happy with this refashion! I hadn’t been able to post for a while because I lost my loginability. But I just found a stored page that still had my password stored in it which let me log in to the dashboard! So I’ll be able to post again… probably in a few days as I’m in town o/n tomorrow night.